Tonight’s dinner was so delicious, I feel guilty for eating it alone. When I first embarked on my quest to eat healthier a year ago, I thought I would never enjoy eating again. Thank goodness for Wildtree. With the help of Wildtree, I have learned that you don’t have to eat unseasoned, boring food in order to put all natural ingredients into your body. Through the journey with these products, I have also rediscovered my love of cooking and creating new recipes. Tonight’s recipe was inspired by some recent online classes I have enjoyed. I want to not only offer my Wildtree customers a catalog of healthy products; I want to offer them knowledge and fresh ideas for their families. Apple balsamic salmon over a rich tomato sauce, paired with zucchini Carpaccio and gluten free gnocchi, is what was on the menu tonight. For the salmon recipe, place your salmon in a greased baking dish. I always line the pan with heavy duty foil – makes cleanup a breeze! 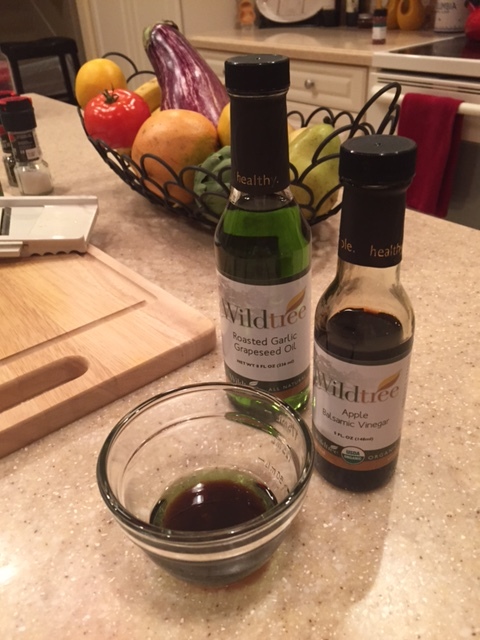 Mix together equal amounts of Wildtree Garlic Grapeseed Oil and Wildtree Apple Balsamic Vinegar, and pour over the salmon. Bake at 375 degrees for 30 minutes. When selecting your fish, it is good to know that there are some strong opinions out there with regard to farm raised fish v. wild. Research shows that fish that is farm raised has a higher level of PCBs – 5-15 times higher, in fact. There is also some concern about antibiotic levels in farm raised fish, among other things. In my opinion, the concerns about farm raised fish far outweigh any concerns about wild fish, but you should decide for yourself. While the fish is baking, prepare the zucchini Carpaccio and the tomato sauce. The zucchini Carpaccio is an uncooked dish. 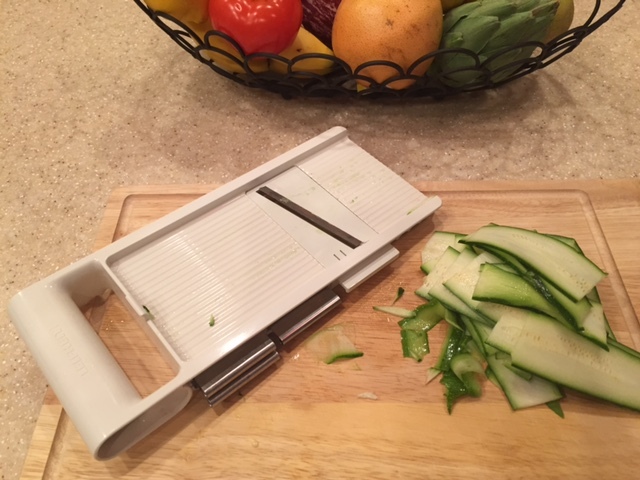 You need very thin slices of zucchini, as shown here. If you don’t have a mandolin, you can use a vegetable peeler. 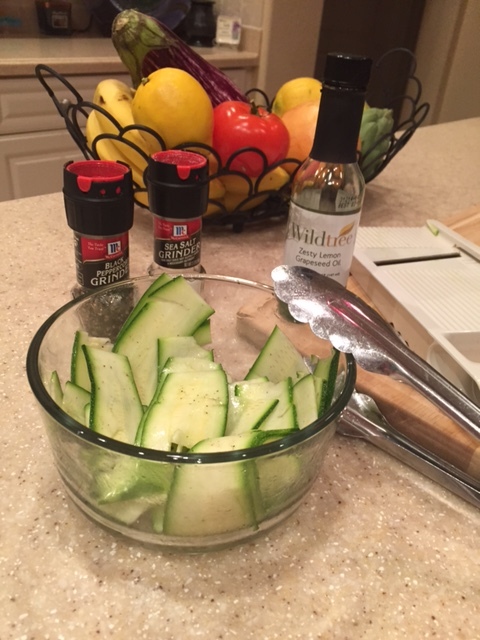 Drizzle the zucchini with Wildtree Lemon Grapeseed Oil and season with fresh ground salt and pepper. When serving, sprinkle with fresh mint and fresh grated parmesan. Here is something that you need to know about mint, and basil, which we will be cutting up for the sauce. They are tender. If you are rough in your chopping, they will turn black. To keep them looking pretty in your dish, you need to use a chiffonade method of cutting. Stack the leaves, roll them in a tight roll like a cigar, and slice thinly in a smooth motion. 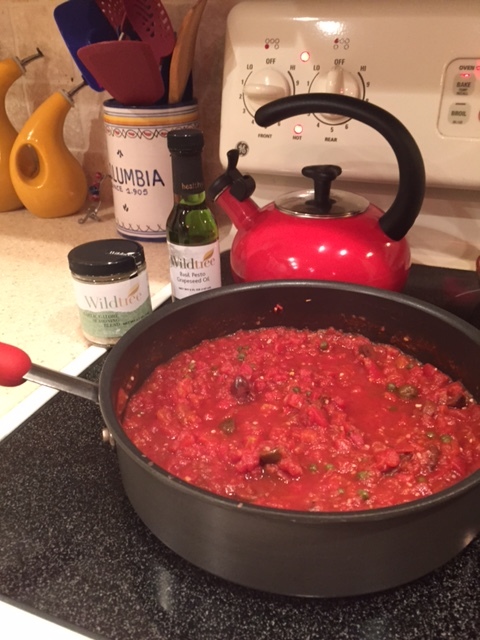 For the sauce, combine a box of organic chopped tomatoes, ¼ cup of white wine, 3 tablespoons of capers, 3 tablespoons of Kalamata olives, a sprinkling of red pepper flakes, 1 tablespoon Wildtree Garlic Galore seasoning. 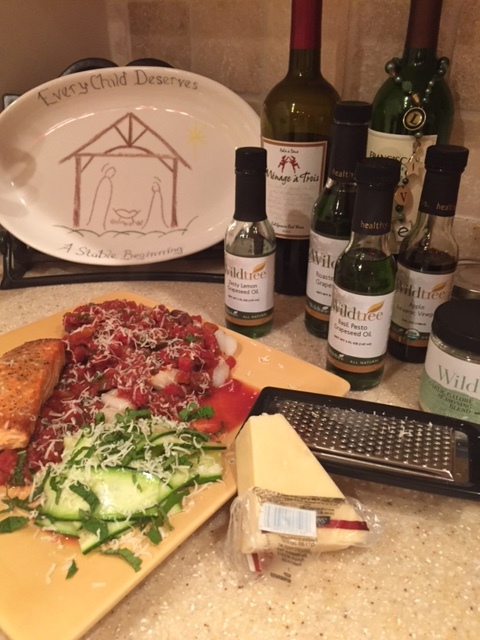 Simmer while the salmon cooks, and during the last 2 minute add 2 tablespoons Wildtree Basil Pesto Grapeseed Oil and 1 tablespoon each chopped fresh mint and basil. For the gnocchi, I used CoraBella gluten free, and was it ever good! I love gnocchi but avoid as much gluten as I can, so I decided to give it a try. I was leery, but I am so glad I gave it a shot. It was just as rich and wonderful as the traditional kind. The gnocchi cooks in just a couple of minutes, so just have your water boiling and ready, and drop the gnocchi in about 3 minutes before your salmon is ready to come out of the oven. That’s it – a delicious, nutritious meal good enough to serve company, and done in just 30 minutes. Now that’s what I’m talkin about!